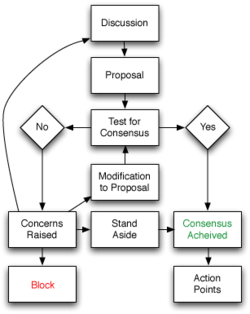 Consensus is a term which describes general agreement among members of a group or community. It also means the theory and process of bringing a group together in agreement. We are really strongly focused on consensus. One criticism of Wikipedia is that the majority rules. But majority is not the right way to describe it. We strive for consensus rather than majority rule. If you are in a group of five or ten people working on an article, if 30 percent of those working on the article dissent, then continue to write the article until all but the most unreasonable agree. Those who continue to disagree are typically exhibiting non-collaborative, and sometimes abusive, behavior. ↑ Shutt, Randy, "Consensus Is Not Unanimity: Making Decisions Cooperatively," Vernal Education Project; retrieved 2013-1-25. ↑ Farber, Dan. "Deconstructing Wikipedia at the Berkman Center," CNET, May 15, 2008; retrieved 2013-1-25. This page was last changed on 9 February 2019, at 15:02.